Antelope Island State Park, in the middle of Utah's Great Salt Lake, is one of my favorite places to bird. I love it out there. Millions of birds, and also bison, pronghorn, bighorn, mule deer, and other western goodies. I've been in love since my first visit back in 2013. On my latest visit, this past February, I wanted to commemorate my love for this state park via the purchase of some kind of doodad. Perusing the gift shop (no Chukars in the parking lot, this time), I saw a little coffee mug but a bunch of shorebirds on it. Hey, I like coffee and shorebirds! I exchanged American currently for the drinking vessel, and went on birding. Good looking mug, eh? Yeah, cool. This being a birding blog, let's take a closer look at some of the shorebirds depicted. Just for yuks. I've known for years that I wanted to get a bird tattoo, but it was hard to settle on an image. As you might have guessed from my frequent and annoying correction of mis-identified birds in popular culture, I wanted something realistic. I wanted a bird tattoo because I love birds, not to support whimsy or because I was a 20 year old girl who had just left hime and wanted to show how much I loved my new found freedom. For example, I wanted something unlike every single image you find when you Google "bird tattoo." For awhile I was set on getting a page from an old Peterson guide. Probably gulls or terns - I don't like color tattoos and they'd just be in black and white - complete with identification arrows and gender names. Like maybe the Roseate Terns below, the two flying birds and the three heads. But, I dunno. Maybe it's copyright infringement? Maybe I just wanted something a little more personal. Maybe I didn't want words. Either way, I found something better. On his (newly-redesigned!) website, SibleyGuides.com, David Sibley sells some of the original pen and ink drawings he made for old newspaper columns and other publications. Check them out. 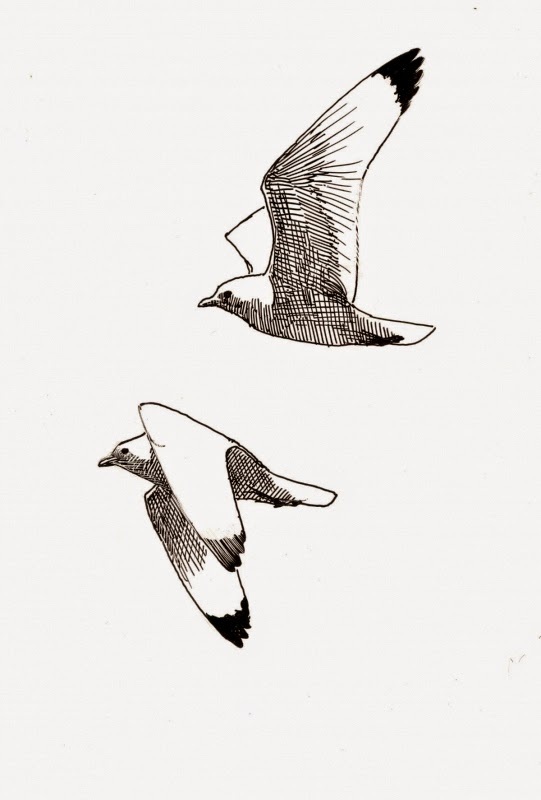 I bought one of those old drawings, one showing a pair of black-legged kittiwakes in flight, about a year ago and had it framed. Here's the image. Cool, right? Simple, but I liked the momentum of the image and that kittiwakes are, like, kind of a connoisseur's gull, know what I mean? My decision was made, now it was just time to do the dang thing. Through random fate of a Google search I landed on the Champion Tattoo Company, on Barrack's Row in SE DC. An appointment was made for March 31 - my 32nd birthday - and after a lovely dinner with my fiancee I strolled in and let Butch get to work. Great guy, that Butch. We talked a lot about fracking, living in Europe, the Appalachian Trail, and that the rent it too damn high. 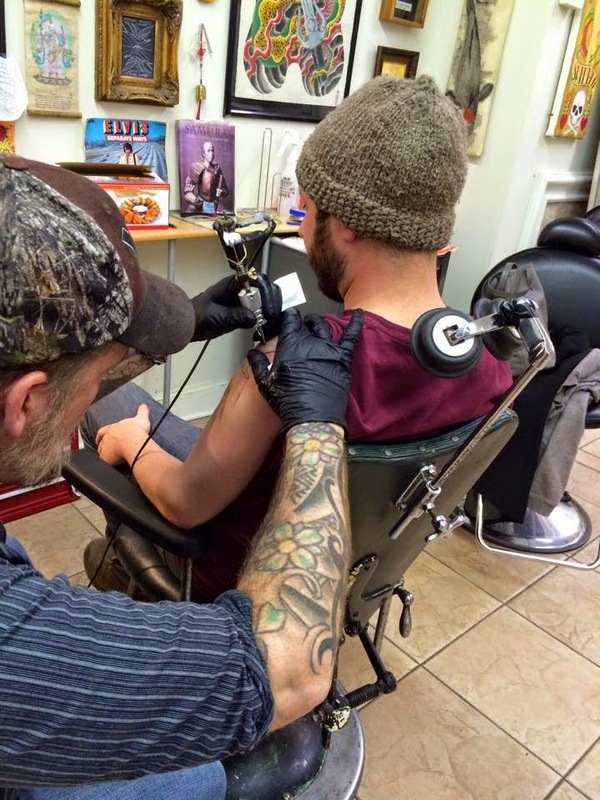 Here he is at work on my arm. And here it is now, all healed up and ready for life. Anyone else got some bird tattoos they want to share?